BusinessWire: Leica Camera AG and pmdtechnologies announce a strategic alliance to jointly develop and market 3D ToF sensing camera solutions for mobile devices. The geographical proximity of the two companies allows a particularly fast and efficient coordination during development, testing and optimization of the lenses for the 3D sensor systems. 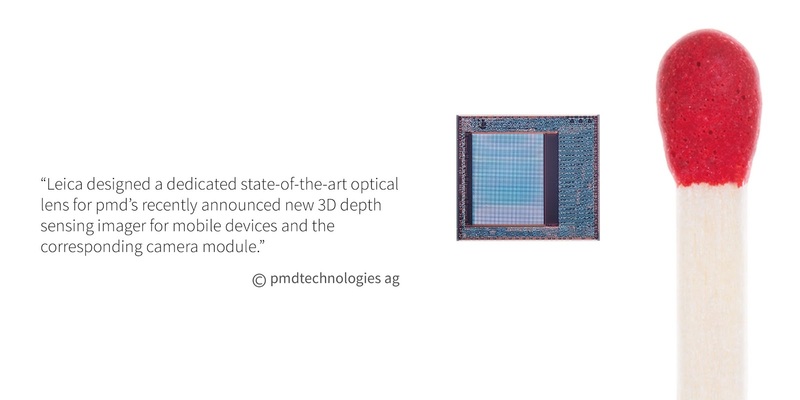 During the last months Leica designed a dedicated state-of-the-art optical lens for pmd’s recently announced new 3D depth sensing imager for mobile devices. By decreasing the f-number by 25% and simultanously decreasing the height of the pmd module by 30% to 11.5x7x4.2mm the dedicated lens for pmd’s latest 3D ToF pixel- and imager generation leads to a significant improvement compared to past lenses. As the Leica lens is optimized for a wavelength of 940nm, it enables ambient light robustness. With a depth data accuracy of 1%, the system is expected to reach the best in class performance despite the miniaturization regarding pixel, imager and module size. First samples of the new lens will be available in May 2018. Does anyone know the weight of this new Leica-PMD module?